The legal and regulatory structure of water policy in the United States is a sometimes beguiling architecture. If we try to envision this structure as one building, it might feel as if we were inside of a funhouse hall of mirrors. In other words, the duties that might logically belong to one government agency are instead reflected across the room to another department. Other areas, like groundwater management, are shrouded by a dark curtain, without enough information to know what is really going on inside. From this blueprint, a team of authors at the Pacific Institute*, a California-based environmental research and policy organization, would like the U.S. government to do some remodeling. The authors present a sweeping vision for a reformed federal role in water management in a new book, A Twenty-First Century U.S. Water Policy, published today by Oxford University Press. Like seeds in the wind, water management duties over the past two centuries have been scattered among a mix of federal, state, local, and tribal agencies, each with a particular legal framework. In the federal government alone, more than 30 entities receive funding for water-related programs. Water-quality regulations have not kept pace with a burst of chemical compounds. Water-supply shortages are becoming more common in many sectors. Water infrastructure is old, leaky, and splitting at the joints. Energy demands have resulted in policies that are blind to their effect on water and food. Population growth threatens to increase water demand, while climate change simultaneously cuts supply. 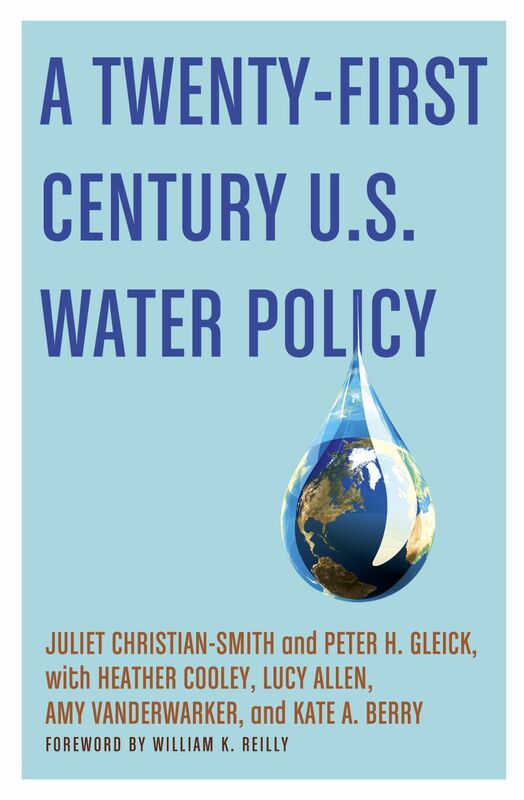 Christian-Smith told Circle of Blue that the book’s authors — who include Pacific Institute president and MacArthur Foundation award winner Peter Gleick — do not recommend federal control of water allocations. That should remain the purview of the states, she said. In collecting data on water use and in conducting basic research. Beyond these general cases, the federal government should “provide comprehensive policies to ensure that our nation’s public water resources are adequately protected from pollution and overexploitation, [are] used efficiently, and [are] managed in a way to ensure continued national and economic security,” Christian-Smith and Lucy Allen write in the book’s second chapter, which is required reading for anyone who desires a concise summary of state, federal, and tribal water laws. While A Twenty-First Century U.S. Water Policy includes chapters and recommendations about water’s role in energy, agriculture, and ecosystems, as well as sections on environmental justice and foreign policy, the authors begin with what they consider most essential: data. It is difficult to manage an unknown, and water is no exception. The key measures in this case are 1) how much water is available and 2) how much we use. Both components are “critical but poorly understood,” Gleick writes in the book. A first step, the book argues, would be to restore funding to the U.S. Geological Survey for its stream-gauge network, which is losing long-term gauges due to budget cuts, and to provide more financial support to other research agencies such as the National Oceanic and Atmospheric Administration (NOAA) and the National Aeronautics and Space Administration (NASA). On a much grander scale, the authors suggest reviving river basin commissions as the focal point for local water management and planning. These commissions were proposed during the Truman Administration, and then six were eliminated by President Ronald Reagan’s executive order in 1981. A few — the Delaware River Basin Commission, the Susquehanna River Basin Commission, and the Great Lakes Commission — still exist via Congressional compacts. The authors also suggest a national water council that reports directly to the president. The council, comprising water experts from various academic disciplines and both the public and private sectors, would be the center around which national water policy and research would turn. Many of the other recommendations in A Twenty-First Century U.S. Water Policy flow from a perspective that the Pacific Institute calls the “soft path” for water. The “soft path” is a breed of water resources development that emphasizes efficiency, integrated management, environmental needs, and decentralized systems over the dams, pipelines, and isolated agencies of the 20th century. As with any ambitious argument, it is easy to find fault with small elements. In the chapter on municipal water use, the most recent government data on infrastructure needs are not used. And some of the recommendations — eliminate all federal subsidies that “promote activities that pollute or waste water” — are vague or improbable, and thus not particularly useful. Nonetheless, it is a broad, well-reasoned plan with both line-item policy prescriptions — for example, new water-efficiency standards for appliances or tiered rates for water from federal projects — and major reconstructions, like establishing a national water council or expanding the Clean Water Act to include groundwater quality. Furthermore, in their work with governments in other countries, the authors have seen examples of national water policies revamped in the face of new realities. In the U.S., she said later, “we haven’t had an opportunity to feel a water crisis to galvanize political will at a national level.” But with more than half the nation’s counties now declared disaster areas because of drought and with the natural gas boom bringing greater public awareness of the connections between energy extraction and water use, the country might be primed for such a discussion. A Twenty-First Century U.S. Water Policy is certainly being published at an auspicious time, and its recommendations deserve serious consideration. But any changes that come about may just hinge on the weather. ***Disclosure: Circle of Blue is an independent affiliate of the Pacific Institute.